Many of us have experienced a traumatic event in our lives, whether in childhood or adulthood. This trauma may be emotional, or it may cause intense physical pain. In some cases, it can cause both. Studies have shown that compassion and mindfulness based interventions can help people suffering from trauma to experience less physical and emotional pain in their daily lives. What’s more, many long-time yoga and meditation teachers have a history of teaching these practices to their clients with successful outcomes. In Yoga for Emotional Trauma, Mary and Rick NurrieStearns present a yogic approach to emotional trauma by instructing you to apply mindful awareness, breathing, yoga postures, and mantras to their emotional and physical pain. In the book, you’ll learn why yoga is so effective for dealing with emotional trauma. Yoga and mindfulness can transform trauma into joy. It has done so for countless millions. The practices outlined in this book will teach you how to use and adapt the ancient practices and meditations of yoga for your own healing. Drawing upon practices and philosophy from eastern wisdom traditions, and texts such as the Yoga Sutras of Patanjali, the Bagavad Gita, and the Buddhist Sutras, this book will take you on a journey into wholeness, one that embraces body, mind and spirit. Inside, you will discover the lasting effect that trauma has on physiology and how yoga resets the nervous system. Combining yogic principles, gentle yoga postures, and mindfulness practices, this book filled with sustenance and practical support that will move you along your own healing path. 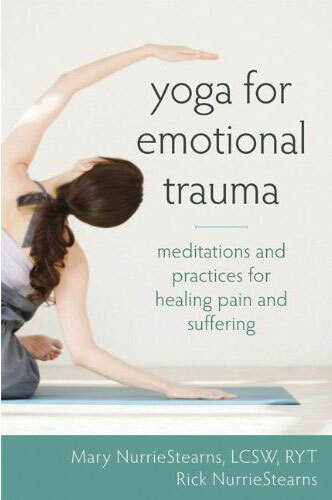 “Yoga for Emotional Trauma fills a gap in the trauma and recovery literature.